VaMeKa Associates an innovative company teaching products such as CPR/AED, First Aid and more. Our goal is to train people on what to do in emergency situations. Offering a variety of programs. VaMeKa Associates will tailor to the needs of its clients and students. We also offer the most up-to-date quality material, in the field of health and safety as well as crisis management. The flexible services allow for small class sizes, flexible schedules, and competitive rates. Our twenty year history insures the experience you need to train new and existing students. What are the services offered by VaMeKa Associates? VaMeKa Associates offers several areas of training for emergency situations. Our programs include CPR/AED, First Aid, Blood Borne Pathogens, and Emergency Medical Response. We specialize in Crisis Intervention Training. We teach modules that will help you to recognize potential crisis situation and will teach you how to deescalate such situations. We also assist in developing behavior plans. VaMeKa Associates offers services in all of New England and New York state. Examples of Organizations that have utilized our programs. are, CAFAFCT, Rhode Island ENT Allergy Group,﻿ Hotels, Residential Facilities, Day Care Facilities, Home Day Care Centers, Adult Day Care Facilities, Group Homes, Community Service Providers, Hospitals, Day Care Centers, Public Schools, and Scuba Diving Schools/Facilities. 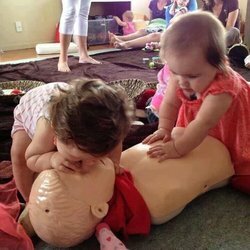 We teach people who need and want to know CPR and any service we provide. Life guards, coaches, caregivers, teachers, guardians, and nurses are just some of the people who utilize our training programs. Copyright 2011 VaMeKa Associates. All rights reserved.